Just as a triode can receive the super-triode treatment, the pentode can also be made super. By super, I mean that we can add solid-state devices to carry the heavy load under the vacuum tube's direction. But unlike the triode, the super treatment can only be applied to the pentode when it works in a cathode follower configuration, as the pentode's plate resistance is staggeringly high and offers too little control of the pentode's current conduction. The pentode's cathode, on the other hand, works in our favor, as it does greatly control the flow of current through the pentode. Ideally, we want to achieve three goals: the tube operates under constant-current conduction, the solid-state device/devices do all the heavy lifting, and the triode must control what the solid-state device/devices do to the output signal. Let's start with a simple pentode-based cathode follower that is augmented by an N-channel MOSFET. This is a power-buffer circuit. No voltage gain is realized and the goal of unity-gain is not completely reached. in other words, we passed on the chore voltage gain to the line-stage amplifier. If the line-stage amplifier is tube-based, +/-16Vpk of output swing should not prove difficult. The EL84 pentode idles at 25mA, while the MOSFET idles at 1.975A. The constant-current source is set to 2A of current flow, which implies a peak output current flow of 2A, which in turn implies a peak voltage swing of 16Vpk into an 8-ohm load, resulting in 16W of power output. The large-valued coupling capacitor must be used, as at start-up the EL84 will be cold and not conducting, which will throw the output to about -18V. Not good. The 180-ohm cathode resistor sets the EL84's idle current. The -9Vdc bias voltage presented to the EL84's grid allows the output stage to center near 0V. Of course, we can expect some drift with age and wear on the pentode. Thus, a sensible addition would be a bias potentiometer. Or, we add a DC servo circuit to keep the output centered at 0V. Note that the OpAmp's positive power-supply pin attaches to ground, not the positive power-supply rail voltage. Why? Although some OpAmp can tolerate +/-22V power-supply rail voltages, most cannot. By using two 1M-baded two-resistor voltage dividers, we can get away with a generic OpAmp. This is a nice trick to remember. (If the output is to be DC coupled, i.e. No coupling capacitor, we should use 0.1% 1M resistors.) The two added diodes are there for additional safety at start-up; until the pentode warms up, it cannot control the power MOSFET. On the other hand, If the power-supply rail voltages are lower, we can use the generic DC servo setup, as shown below. The two safety diodes are retained and the OpAmp is powered by the +/-12Vdc rails. With the reduced rail voltages and reduced constant-current source current flow (1A), the peak power output into an 8-ohm load drops to 4W. Now, 4W may seem crazy low, but many super-sounding 2A3-based single-ended amplifiers only put out 2.5W. This power buffer also runs in single-ended mode. Is there no way we can lose the icky coupling capacitors? Indeed there is. Let's use a lower idle current version that would be ideal for driving inefficient headphones. 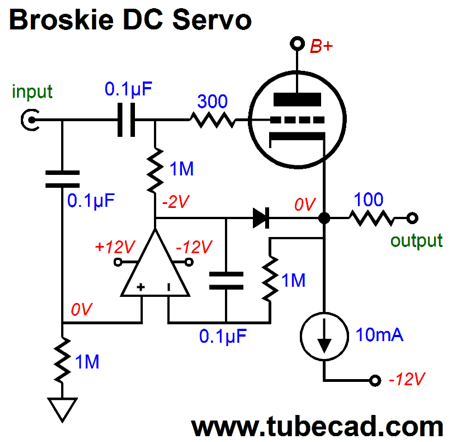 The DC servo has been upgraded to a Broskie DC servo by the addition of the extra input coupling capacitor and 1M resistor to ground. The configuration presents the music signal to the OpAmp's non-inverting input, so the OpAmp's output will trace the input signal. Because the OpAmp's output follows the input signal, we can the diode that bridges the OpAmp's output to the EL84's cathode, as the OpAmp's output voltage should always be more negative than the pentode's cathode voltage, so the never becomes forward biased—except at start-up. At start-up or when the tube is missing from its socket or the heater element has opened, the OpAmp's swings sufficiently positive to to force the output to center at 0V. Once the pentode is hot enough to conduct, the DC servo's output swings back to being negative relative to the pentode's cathode voltage and the diode effectively drops out of the circuit. Okay, let's now move to an interesting trick (or, as they say in web-ads, "one weird trick the makers of high-end audio amplifier do not want you to know"). If we deliver regulated DC to a pentode's screen (grid-2), the pentode acts as if its plate also saw a regulated B+ voltage. Well, why not give both the screen and the plate a regulated Dc voltage? We could, but the screen only draws a fraction of the current that the plate draws. In a headphone amplifier this might might be a big deal, but in a big OTL power amplifier based on power pentodes, such as the EL509, it is a big deal. In addition, we can use the regulated screen voltage to also power the input stage. This is a complete headphone amplifier. The input triode provides the signal gain and the pentode-controlled output stage delivers the heavy current swings required. Since we do not need a lot of gain, I would use a 12AU7 as the input triode. In addition, we could power the EL84 and 12AU7 heaters with the +/-12Vdc power-supply rails. I think at one 12AU7 and two EL84 tubes would make a great looking little headphone amplifier. Since the N-channel MOSFET and constant-current source do not dissipate much heat (2.4W each), their heatsinks could be located within the chassis. Of course, we could add many more bells and whistles, such as an output relay and a protecting zener to limit the maximum MOSFET current conduction. Long-time reader, Arjun, decided to run some SPICE simulations on a MOSFET-based Triadtron. He was thrilled with the results and was baffled at why others weren't proclaiming its virtues. He, unfortunately, fell for a trap within SPICE, the constant-current source, which finds no equivalent in reality. This SPICE part is not alone, as capacitors, inductors, resistors, and voltage sources also find no exact equivalent in reality. For example, let's take the lowly 1-ohm resistor in SPICE. Unlike real resistors, this resistor comes matched within 0.000000000000000001% with another 1-ohm resistor in SPICE. And unlike real resistors, this resistor has no wattage limit, as we can drop a trillion volts across its leads and it survives. Do not try this in reality. Regarding the schematic above, everything looks good and the SPICE simulation are truly fine. But as the SPICE constant-current source delivers current in the absence of voltage and can find no practical equivalent in reality, this circuit is confined to the world of SPICE. Importing to reality requires acknowledging that real constant-current sources (which are actually current regulators) exhibit a minimum voltage drop, usually at 1V to 2V, below which the device ceases to work. In addition, we must factor in the negative source-to-gate voltage for the P-channel MOSFET, about -4.5V in this example. in other words, the constant-current source must attach to a negative power-supply rail at least -6.5V more negative than the -12V power-supply rail, in this case -18.5V. The -24V power-supply rail voltage saves the day, as it ensures that the constant-current source never becomes voltage starved. But must we add another secondary tap or an additional power transformer to realize this -24V power-supply rail? No. We only need to add three extra capacitors and another rectifier bridge. Note the relatively low capacitor values for achieving the -24V power-supply rail. Another option is to replace the solid-state constant-current source with two resistors and capacitor. This workaround works well with music, but not so well with prolonged steady sinewave tests and extreme output voltage swings. How extreme? Let's say +/-8Vpk. The problem would be found in the 1kµF capacitor discharging with excursions that extend below the -12V power-supply rail voltage. By the way, since this Triadtron idles at 1A, we can expect a peak output current swing of 1Apk, which would equal 8Vpk voltage swings into an 8-ohm load, which in turn implies 4W of about. Here is the SPICE-generated Fourier graph for the circuit shown above with two resistors in place of the constant-current source. The SPICE models were for the IRFP230 and the IRFP9240; the transistor model was that of an MJE350. Not bad. Note the very single-ended harmonic structure with both versions. The two-resistor version offers only slightly more distortion over the SPICE perfect constant-current source. Roughly, both offer a THD of about 0.1% at 4W output into 8-ohm loads at 1kHz. The LT6658 is a not a constant-current source—strictly speaking; it is a voltage reference with dual outputs. It can, however, form the heart of two excellent constant-current sources. This listing of key specifications and feature illustrates LT6658’s performance. Key reference specifications include drift at 10 ppm/°C and initial accuracy at 0.05%. Key regulator specifications are load regulation at 0.25 μV/mA with two outputs sourcing current at 150 mA and 50 mA. Outstanding PSRR, low noise, output tracking, and a noise reduction pin combine to bring together the best of both the reference and regulator worlds into a single package. In its datasheet, we see the following schematic, which shows how to create a constant-current source with the LT6658. I belive that this schematic holds an error, however, as the 1µF capacitor that attaches tot he 2N3904's base probably shouldn't be there. But then, perhaps, I am wrong and the internal OpAmps require to the capacitors to be there. Now, imagine powering the LT6658 with a +12Vdc power-supply rail, which could also power a tube's heater; and making two constant-current sources, one for each channel's differential amplifier. Another possible use would be to build a high-voltage regulator with the LT6658 and a few parts, which would include a 9V battery. The LT6658 will float with its 9V batter power supply and the output voltage will climb to the voltage that allows 2.5V to be developed across the top resistor in the three-resistor string. The electrolytic capacitor will charge up slowly, which will make the output voltage also slowly climb up to full output. I had forgotten Irene Kral. I don't know how I did, but I did. I was looking through an old audio magazine and I saw her name; a minute later, Tidal was up and running—and I went searching. A thick vein of gold lay before my yes and ears. Tidal holds 16 albums by her. Is this really that good of news? It is indeed, Irene Kral is one of those female jazz singers who always appears on list of great singers that should be more famous. This brings up an interesting question: What makes for a great jazz singer? Having a fantastic set of pipes, as Ella Fitzgerald did, helps. Looking gorgeous, as Connee Boswell and Julie London and Lena Horne and Sarah Vaughan were, cannot hurt. But what is essential are individuality and depth of feeling. It's not enough to just sing well and look attractive, in other words. For example, Connie Stevens sang well and looked stunning, but her voice lacked individuality and depth. "Billie Holiday could transform the most banal pop ballad into a painfully intense, subtle work of art. She was the ultimate jazz singer, relying on a deeply honest delivery and an exquisite control of her rather small range. " At its best, Jazz transforms the banal into subtle works of art. You cannot mistake Holiday for any other singer; nor, can anyone not feel her depth of feeling as she sang. "Irene Kral was not just another jazz singer. She had a delicate style, yet every note was placed with deliberate aim, and she always hit her mark with unerring accuracy. She had a brilliant flair for picking tasty, little-known material, often by up and coming young, jazz-influenced songwriters. She recorded only a small number of albums, often on small, jazz labels and she never sang in a show-off way, never scatted, never belted or raunched out her voice. Most aficionados of female vocalists have never heard of her, and she remains largely forgotten in the jazz history books. Yet her work deserves to be searched out, for her intimate style and purity of tone." While looking over Tidal's collection of Irene Kral albums, I saw an array of similar artist listed at the bottom of the screen. One of the singers that I didn't recognized was Meredith d'Ambrosio. I decided to give her listen. Well, this is way Tidal is worth the $20 a month, as I doubt that I would ever be lucky enough to stumble on her otherwise. Much like Kral, d'Ambrosio is a master of tasteful understatement. I recommend that you start with her album, Echo of a Kiss. Special Thanks to the Special 67! If you have been reading my posts, you know that my lifetime goal is reaching post 1,000. I have 559 more to go.